The State Cartographer’s Office, a unit of the UW-Madison Department of Geography, needs your help! 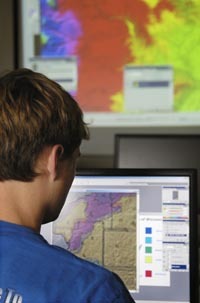 We currently have three openings for students interested in geospatial and Web technologies. You’ll be asked to work on projects and problems with minimal supervision… if you like to be told step-by-step what to do, then this job might not be for you. We expect our students to work 10-15 hours per week. In return, we offer a very flexible schedule that can work around your class schedule, and yes, those occasional all-nighters. Up to 20 hours per week are possible during the summer. We expect you to be an active learner. Period. We know you haven’t had a “real” job yet, so we get the fact that you need time to learn. We expect this… but we also expect you to take that responsibility seriously. We need you to work in our lab located in Science Hall, because remote work arrangements are not possible in our highly collaborative environment. Our starting pay is $12.00 per hour.